HMAS Brisbane left Sydney for her second deployment to Vietnam on March 16, 1971 with Captain R. G. Loosli in command of what was to be the last Vietnam combat tour for an RAN destroyer. Brisbane arrived at Subic Bay on March 25, and the next day Captain Loosli (Left of Picture) took ‘The Weight’ from Captain I. M. Burnside of HMAS Perth in the presence of Mr. J. C. Ingram, Australian Ambassador to the Republic of the Philippines. 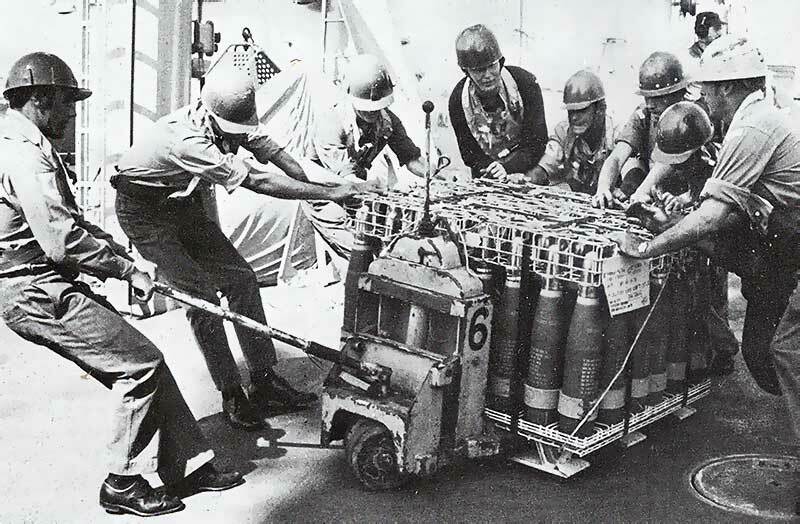 Brisbane carried out the usual gunnery and antisubmarine warfare exercises off Subic Bay before leaving for Vietnam. On April 5, she took up station off Phuoc Tuy province as NGFS ship for the 1st Australian Task Force and that afternoon, fired on bunkers and trails in 1 ATF operations north east of the Long Hai hills. Another day of successful firings against targets in the same area followed before Brisbane was reassigned to Military Region 4, as NGFS ship for the 33rd Regiment, 21st ARVN Division, being stationed off the U Minh south east of the island Hon Nam Du. The USCGC Morgenthau (WHEC 722) was the Market Time patrol vessel in the area. A large sampan under way on a canal was fired on early in the morning of April 9, but as the spotting aircraft was running short of fuel the firing had to be abandoned after five ranging salvoes. Firings later in the day were more successful, with a sampan, a bridge and several bunkers being destroyed. Further firings on the east coast of Military Region 4 had troop concentrations, fuel storage areas and a motor sampan as targets before Brisbane left the area. By April 17, Brisbane was off the coast of Binh Tuy province, northern Military Region 3, firing in support of the 1st Air Cavalry Division. She entered Vung Tau the next day where she received onboard Mr Justice Kerr and members of his committee who were inquiring into conditions of service in the Australian Armed Forces. The committee visited the ship to meet members of the ship’s company and to observe the conditions under which they lived and worked. A bunker area and enemy rest area were fired on from Vung Tau on April 19 for the 1st Australian Task Force. On the 21st, Brisbane completed her first period ‘on the gunline’ and left for Singapore. By comparison with the tours of Perth and Hobart, naval gunfire support activity had slackened considerably with Brisbane firing only 552 rounds in sixteen days. Five days saw no missions at all. Harassment and interdiction fire which had formerly accounted for more than fifty per cent of the total rounds fired was now greatly reduced. Much of this lessened NGFS activity was caused by bad weather conditions which hampered spotted fire missions. Brisbane's R & R period in Singapore was followed by boiler cleaning in Subic Bay and a short visit to Cebu City. The ship returned to the gunline in Military Region 1, arriving at Da Nang on May 15, and relieved USS Floyd B. Parks (DD 884) to become command ship of Task Unit 70.8.9. 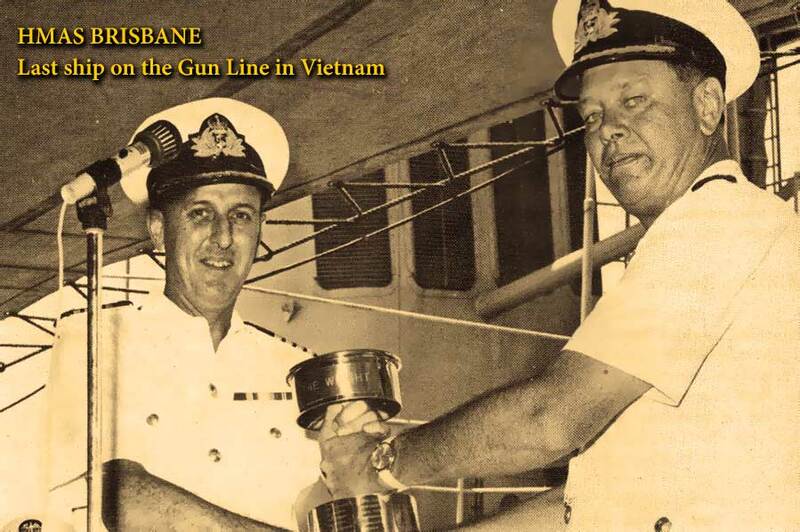 Though RAN ships had previously been the command ships of Sea Dragon task units, and Captain Doyle of HMAS Perth had taken command of the Sea Dragon task group in February 1968, Captain Loosli was the only RAN officer to become gunline commander for the NGFS task unit. Brisbane sailed north to the DMZ and remained nearby until the end of the month supporting operations of the 1st ARVN Division in northern Quang Tri province and firing on air-spotted targets in the DMZ. Ships firing on targets in the Demilitarised Zone were restricted to remaining south of latitude 16 57'N and were required to be more than 5000 yards from the coast. On May 21, enemy vehicles were sighted in the DMZ, but after thirteen rounds from Brisbane they turned back to the north. The next day rocket launching sites were fired on. Harassment targets were regularly fired on at night. On May 29, enemy bunkers and active mortars were successfully attacked, and in the afternoon a concrete bunker on the beach was marked with smoke by a spotting aircraft before being heavily damaged by a salvo from Brisbane. On June 1, Brisbane joined the destroyer screen of the attack carrier USS Kitty Hawk (CVA 63) in company with USS Hansen (DD 832). Captain Loosli took command of the escorting destroyer task unit. While one ship steamed astern of the carrier during the day as a rescue destroyer for flying operations, the other destroyer detached for independent exercises. Brisbane left Kitty Hawk's screen on June 4 to form a surveillance unit with USS Hull (DD 945) for the repatriation of 570 North Vietnamese prisoners of war who were to be brought from Da Nang to the Demilitarised Zone. Only thirteen of these prisoners finally wished to return to North Vietnam, but as planned they were taken by barge towed by tugs to within 1000 yards of the DMZ where it was hoped the North Vietnamese would send a boat for them. The surveillance unit was stationed fifteen miles away. Brisbane soon left to rejoin Kitty Hawk for the operation had to be abandoned as the North Vietnamese finally refused to accept the prisoners. On June 10, Brisbane was sent to join the Positive Identification Radar Advisory Zone Unit whose ships identify aeroplanes returning to the carrier to ensure that they are not enemy aircraft. Brisbane left Kitty Hawk’s destroyer screen on the 12th for eight days rest and recreation in Hong Kong which were disturbed by Typhoon Freda, and Brisbane had to put to sea overnight after three days in the port. On June 24, Brisbane took up station off Phuoc Tuy, again in support of the 1st Australian Task Force. An enemy base camp, bunker system and trails were fired on the same day. Caves in the Long Hai hills, and an anti-aircraft gun site were bombarded on the 25th with many direct hits. Four of Brisbane’s men were exchanged with the Australian Army and went to the Task Force base at Nui Dat. By June 27, Brisbane was on station off southern Kien Giang in Military Region 4 where poor weather prevented calls for fire for two days. Brisbane’s medical officer, Surgeon Lieutenant R. F. Haskett, was transferred to the ammunition ship USS Chara (AE 31) to examine a crew member who had suffered a heart attack, and he accompanied the patient to Saigon. On the 29th, Brisbane supported the 21st ARVN Division, but with poor weather hindering the spotting aircraft the missions were called off after only the ranging salvoes had been fired. Improved weather on the 30th enabled Brisbane to destroy many bunkers and other military structures, with two secondary explosions observed and one enemy killed. Brisbane stayed in the vicinity of the U Minh Forest for the next three weeks anchoring to fire spotted missions during the day, patrolling on a ‘racetrack’ at night, and providing harassment and illumination fire if called upon. By this stage of Brisbane’s deployment, the areas of Military Region 4 which required NGFS were diminishing as most parts of the region were coming within the range of ARVN artillery. Brisbane was joined by USS Brinkley Bass (DD 887) on July 12 and the ships shared the bombardment of military structures and bunkers for the following eight days, before Brisbane went north to Phuoc Tuy province where a day’s firing on three targets took place until Brisbane left the gunline for Subic Bay for self-maintenance. A ten days rest and recreation period in Hong Kong followed, with Brisbane back on the gunline by August 15. A marked increase in enemy activity in the DMZ and the northern provinces of Military Region 1 in early August was considered to be an attempt to influence the elections for the South Vietnam House of Representatives at the end of the month. To counter the heavy mortar and rocket attacks on spotting positions and artillery bases, two NGFS ships were assigned to the DMZ. Brisbane joined USS Berkeley (DDG 15) and the ships alternated day by day as the active NGFS ship until August 21 when USS Shelton (DD 790) relieved Berkeley. That day, Brisbane and Shelton combined to fire on a large enemy concentration and rocket and mortar positions. During this very active period of operations, Brisbane was informed by signal (on the 18th) that she was not to be replaced. The cruiser USS Oklahoma City (CLG 5), flagship of the Seventh Fleet, joined the NGFS unit on August 27 supplementing Brisbane for long-range fire. Such was the tempo of operations in Brisbane’s last period on the gunline that almost half of the 7231 rounds used up to her 79th day on the gunline were fired during the latter half of August. This increased activity almost became an embarrassment to Brisbane as her gun barrels were rapidly reaching the end of their life. During the last ten days of the deployment, Brisbane kept out of the firing line whenever other ships were available, but took up her station again as soon as they were detached for replenishment or other reasons. Using this method of conserving ammunition, Brisbane was kept busy until September 5, the day of her departure from the gunline. Her final rounds completed the maximum number allowed to be fired from each barrel. After anti-submarine exercises and maintenance at Subic Bay, Brisbane left for Australia on September 30. 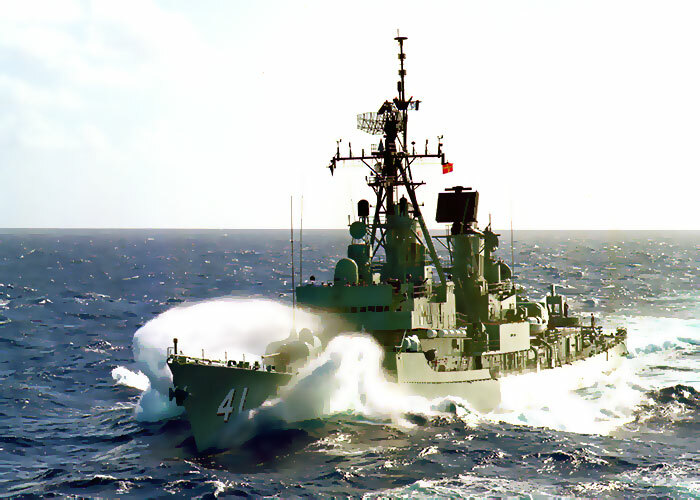 Her return to Sydney on October 15, after steaming 27,011 miles and firing 7760 rounds in her second deployment, marked the end of the RAN’s combat role in the Vietnam War. Webmasters Note: October 15th 1971 also marked the end of the Royal Australian Navy's period of committment to the Far East Strategic Reserve.